Merrimac Farm was originally part of the Brent Town grant. The Brent Town Tract was divided in 1737 giving Samuel Hayward 7,500 acres on the northwest side of Cedar Run. Hayward sold 1,000 acres, including the portion that became Merrimac Farm, to Henry Fitzhugh in 1738. Henry Fitzhugh, of "Bedford" in Stafford County, died in 1758. His will (dated 1757, probated 1759) says, "I give to my son Thomas one moiety [half] of my Brent Town land now in his possession according to a division lately made by his brother Henry to him ... to my son John Fitzhugh the other moiety ... now in his possession." In 1813, Edward Fitzhugh advertised the sale of the 600-acre farm, called Green Level, where he resided. Green Level was purchased by the French family. 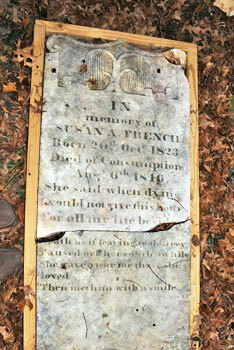 Members of the French Family are buried in the Cemetery that is part of Merrimac Farms. Three markers of family members have been found, and further work is planned to further search for graves, delineate the cemetery, and repair the damaged markers. It has been estimated that there may be as many as 100 graves in the cemetery. One of the grave markers mentioned that one of the children, Susan A. died of consumption, (tuberculosis) at age 22 in 1846. In 1853, Elisha Osmon was the owner of Green Level, and it was divided into smaller parcels in 1865. The portion of Green Level that became Merrimac Farm was purchased by James Kiewit in 1882. It remained in the Kiewit family until 1923, when it was sold to the Hooe family. The Hooe family sold the property to the Reading Family in 1939. In 1959, Philip B. Reading and Marie H. Reading sold the property to Dean Noyes (Mac) McDowell and Mary Benz McDowell. The McDowells renamed the property Merrimac Farm in recognition of the given name of Mary and the nickname of Dean. In January 2008, the Virginia Dept. of Game and Inland Fisheries purchased Merrimac Farm through a conservation partnership formed between the Prince William Conservation Alliance, Marine Corps Base Quantico and the Virginia Dept. of Game & Inland Fisheries. Merrimac Farm was Virginia's 37th Wildlife Management Area and the first to be located in Northern Virginia.